Want to write a poem? Naomi Cohn’s poem “Dementia” is stamped into a sidewalk on Carter Avenue in St. Anthony Park. Naomi Cohn’s poem about memory is stamped into a sidewalk on Carter Avenue just south of Keston Street in St. Anthony Park. That poem, “Dementia,” was placed there in 2008 as part of Everyday Poems for City Sidewalk, the brainchild of Marcus Young, a former artist in residence for the City of St. Paul. Since 2008, some 950 poems have been stamped into St. Paul sidewalks and there are a number of them in the Como Park and St. Anthony Park neighborhoods. 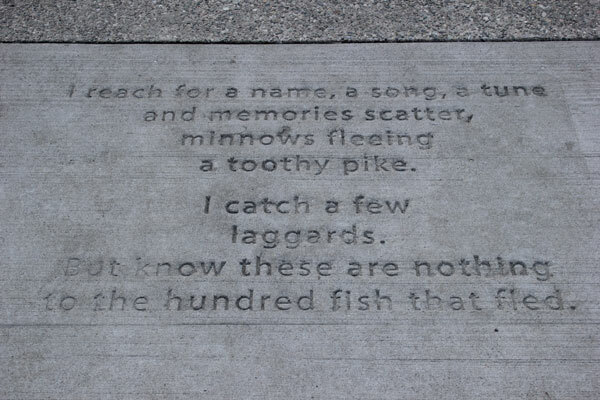 Cohn suggests using the city’s Sidewalk Poetry as your prompt to write a poem. First, seek a poem. Take a walk along these St. Anthony Park streets—Valentine Avenue, Keston Street, Chilcomb Avenue, Carter Avenue or Bourne Avenue—or, in Como Park, walk along Victoria Street between Larpenteur and Arlington avenues and or on Arlington just east of Victoria. There, you’ll find a number of poems stamped into the walks. If you want to venture elsewhere in the city, check out the poetry location finder at publicartstpaul.org/project/#findpoetry-locations. While you’re on your walk, Cohn suggests you pay attention to what you are noticing along the way: What do you see? What do you hear? What do you smell on this April walk? Have you found a poem yet? When you do, take a line from that poem and then combine it with what you sensed on your walk. If you’d like to share your sidewalk walk poem, send it to the Bugle and we’ll publish it in our Letters section next issue: P.O. Box 8126, St. Paul, MN 55108 or editor@parkbugle.org.